Forest Essentials Facial Tonic Mist Pure Rosewater. Plum Natur Studio All Day Wear Kohl Kajal (Black). St.Ives Fresh Skin Apricot Face Scrub. SUGAR It's Pout Time Vivid Lipstick (The Big Bang Berry). Accessorize Heart Shaped Stud Earings (Three pairs). 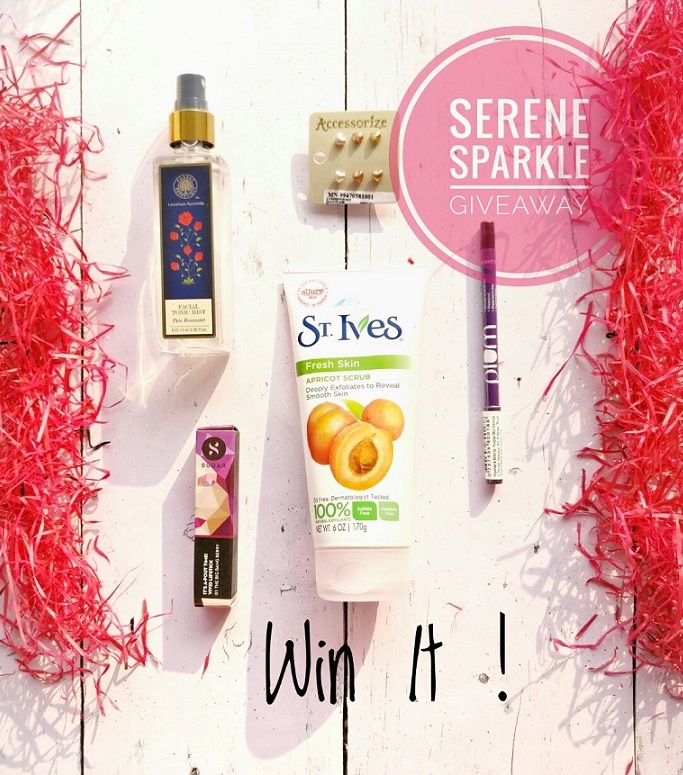 Share the giveaway picture on your Instagram using #serenesparklegiveaway tagging me and five of your friends who would be interested in this giveaway. The Giveaway is open to Indian Residents only and it will run until 28th October. One who does the maximum effort will be chosen as the winner. Don't unfollow after the giveaway ends as it will ban you from participating in future giveaways. The winner will be announced on the blog as well as on my Instagram. Leave your Social Media IDs in the comment section below. Also, I'd love to know is there anything you're excited to win in particular ? Now, what are you waiting for ? Participate !! Tweeted and reposted about the giveaway. Followed on Google plus also. Hola Aditi! I'm a fan of your work, especially your pictures. I mean seriously, the way you click the photographs they're like straight out from magazine pages! The color co-ordinations and angle perspectives are flawless. I want to win this so much because I want to own a sugar lipstick 💄 followed you everywhere, my Instagram name is @a_girl_wit_no_name, twitter account name is Upashana Sarkar, Google + account name is Upashana Sarkar.. Email ID is upasarkar95@gmail.com.. Retweeted, reposted. Thanks for your sweet comment upashana :D Good Luck !!! Completed all the steps . I am your new follower. Many Congratulations on your 2nd blog anniversary :) wish you many more to come. I wish you get more and more reasons to celebrate!! Retweeted and reposted about the giveaway..
thanks a lot dear :) Good Luck !!! Congratulations sweetie. This is a great giveaway with some really cool products. St.Ives Scrub is my all time favorite !! Shared your Giveaway on facebook page of my blog and asked my readers and followers to follow you . Shared your giveaway on Indiafreestuff.in forum ( where i am a member ) , so that members from there can join your giveaway . hello serenesparkle...happy anniversary for your blog! i just loved your reviews your blog page everything looks really pretty the stuff you review is very unique and not just regular stuff that everyone knows about....that's the best thing about your blog i really like it! This is a great giveaway.. Seeing this post since a week in Instagram and have followed all rules by then.. But somehow had not mentioned here.. 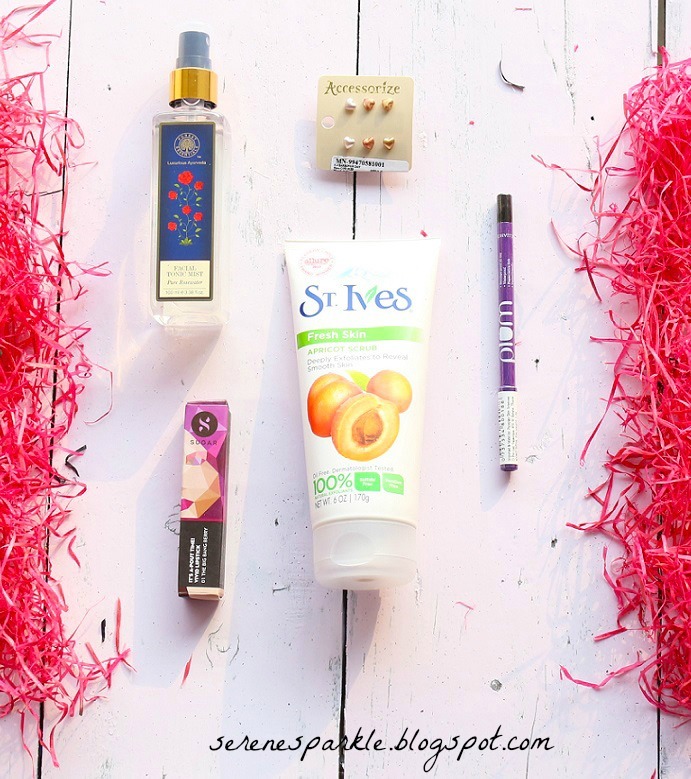 Guess this is the right time 😃 Every product in the giveaway is amazing and great for skin too.. St.Ives is something I love since 3-4 years..
. Great products are always inviting and everybody wish to win..
Hey Aditi, a big time congratulations girl and thanks for hosting such amazing giveaway for us :) I would love to win sugar lipstick and forest essentials rose water Being a regular reader, I follow you everywhere and completed all the steps as mentioned above. Hey Aditi, I just loved your giveaway which has made me a singer. So I wrote this song, you too can sing along. I hope you like it as it comes straight from my heart. congrats dear. keep it up and get more success.